Hello, my question is: I have an old greensand filter I want to replace. I am sick of using the potassium permanganate powder, but I liked the fact that it kept the greensand media clean and free of odors. Can I use chlorine to keep the odors out of the greensand media? Yes you can use chlorine as a replacement for permanganate, but what works even better is to use a manganese oxide iron filter with chlorine instead of greensand. Greensand is a type of iron filter media that is coated with manganese oxide, a natural mineral that is highly attracted to iron and manganese. However, instead of using a coated media like greensand, now you can use the pure stuff: manganese oxide. Manganese oxide media utilizes an oxidation-reduction reaction and filtration process similar to Greensand, but at a much higher level of performance. MangOX out performs Greensand, Birm, Filox and Pyrolox due to the purity of its particles combined with the superior oxidation, filtration capacity, and durability. How this works is typically the filter backwashes as normal, however say every 2 weeks or so you simply drop a couple cups of regular Clorox bleach into the tank and allow the filter to backwash normally. Once past the filter water will then flow into the Softener and then off to the home. The end result of this is clean, non-staining, odor-free water throughout the house without reducing your flow or water pressure. 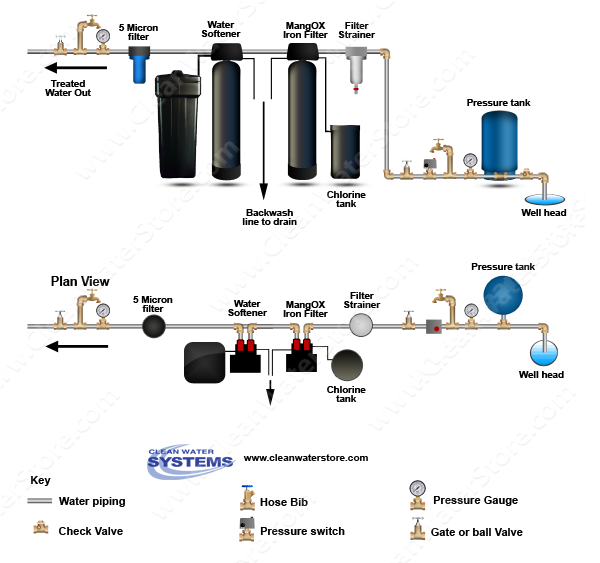 Our Fleck 7000 series of professional-grade filter systems feature high-flow rates with a minimum of pressure loss, are completely automatic, and quite maintenance free. The MangOx also utilizes the Enpress Vortech tank as well to increase flow along with minimizing time of backwash as well. Please see below for additional information on this system, your quote, as well as a general diagram on the installation as well. · MangOX™ contains 80% manganese dioxide in an extremely unique cluster format for enhanced performance and maximized capacity. Works similar to Greensand with superior performance qualities and media life. · Uses the Enpress tank with Vortech distributor which allows the MangOX media to be backwashed at lower flow rates with less water, saving water and energy. 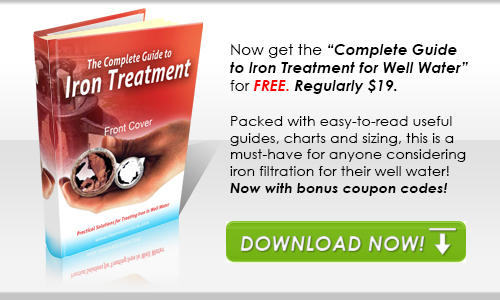 · Chlorine is to be used approximately every 2 weeks or so by means of the attached solution tank, in order to regenerate the media during a backwash so that it can continue to effectively removing iron and odors. · A benefit of this system is that no chlorine will end up in the treated water to the house, it is just used to regenerate the media and flushed to drain during a cycle. 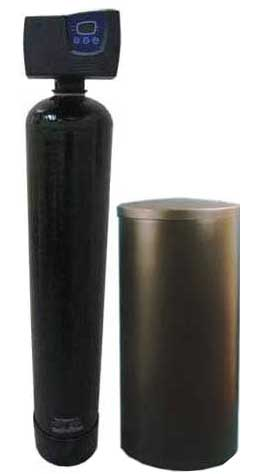 Dimensions: 10" diameter x 61" height ¾" or 1” pipe connectors and Bypass is included. Will arrive in several boxes, all installation instructions are provided as well as Tech-Support should you need it during the installation or down the line. Water Softener, Metered 7000SXT 1.5 Cubic Foot, 48k Grain Capacity. · Features full port bypass valve and will not restrict flow and pressure like some consumer grade softeners will. · Prevents scale and calcium build-up in pipes, water heaters, fixtures, and appliances. · Counteracts drying effects of hard water for softer skin and hair. · Clothes come out cleaner and softer without chemicals bleach or detergents. · Clothing lasts much longer when washed in soft water. Professional Quality, very salt efficient. Uses approx. 12 lbs per regeneration, with water at 36 grains hard will backwash about every 1,125 gallons. Features full port head for maximum flow and minimal pressure loss. Dimensions: 10" diameter x 61" height ¾" or 1" pipe connectors and bypass is included as well, full installation instructions provided.